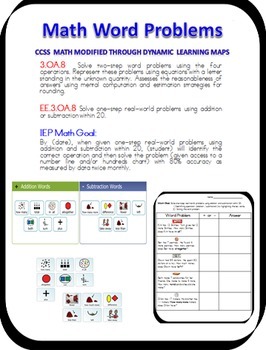 This product is IEP based using the Common Core State Stand 3.OA.8 and modifying this goal using the Dynamic Learning Maps Essential Outcomes. 3.OA.8 Solve two-step word problems using the four operations. Represent these problems using equations with a letter standing in the unknown quantity. Assesses the reasonableness of answers using mental computation and estimation strategies for rounding. EE.3.OA.8 Solve one-step real-world problems using addition or subtraction within 20. By (date), when given one-step real-world problems using addition and subtraction within 20, (student) will identify the correct operation and then solve the problem (given access to a number line and/or hundreds chart) with 80% accuracy as measured by data twice monthly. * 3 pages of example math real-world math problems with bold key words to determine addition/subtraction key words.